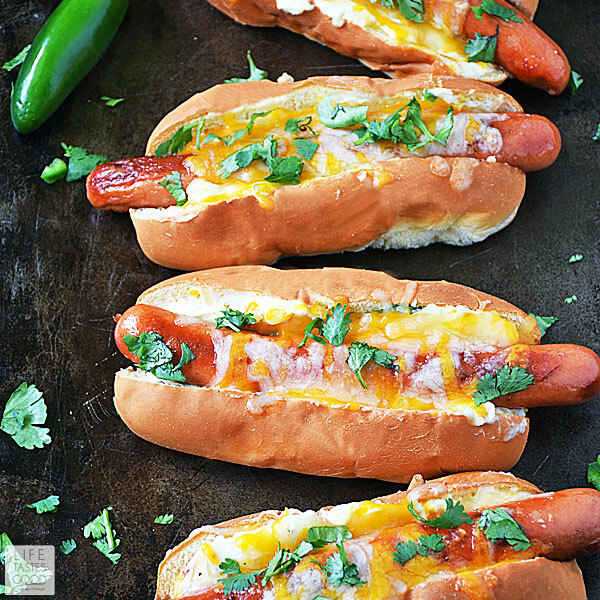 Jalapeno Popper Hot Dogs are a fresh twist on a classic American favorite. 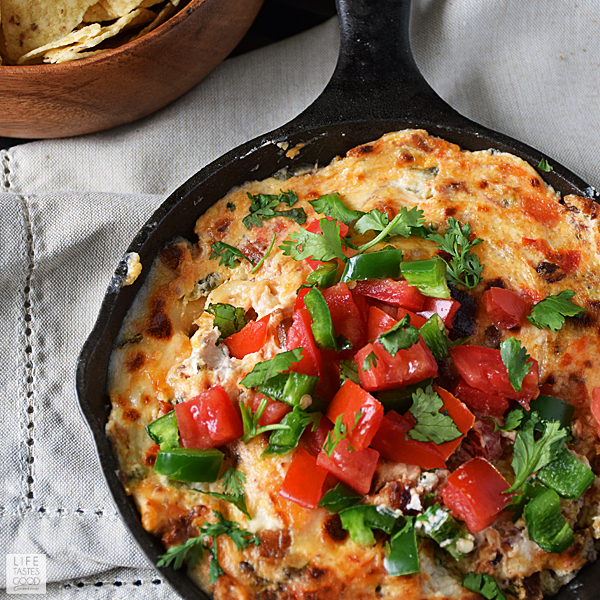 This unique recipe happened because I crave the spicy, cheesy, bacon-y goodness traditionally found in the popular Jalapeno Popper appetizer all the time! Why not put all that deliciousness on a hot dog? We don’t eat hot dogs very often in our home, but when we do we get creative with our toppings. Hot Dogs are a summertime classic and an easy dinner that’s on the table in less than 30 minutes. Switching it up from the same old ketchup and mustard is sure to become a family favorite for dinner. 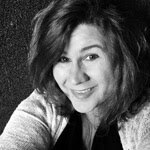 In addition to my Jalapeno Popper Hot Dogs recipe, check out the pictures below of the other creative hot dog recipes I've made over the years. Starting at the top left, is my French Onion Hot Dogs which taste just like our favorite French Onion Soup, but in a handy bun and extra delicious because it's a hot dog!! 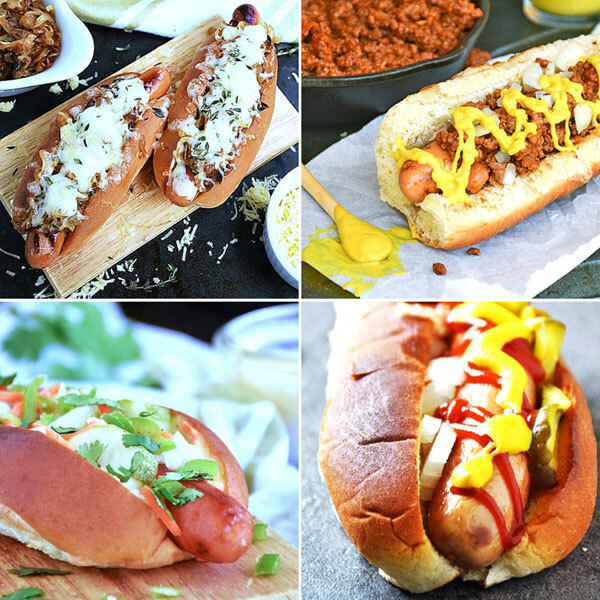 The top right is our Coney Island Hot Dogs with a meat relish, onions, and plenty of yellow mustard. I think my all-time favorite is my recipe for this Banh Mi Hot Dog pictured at the bottom left. 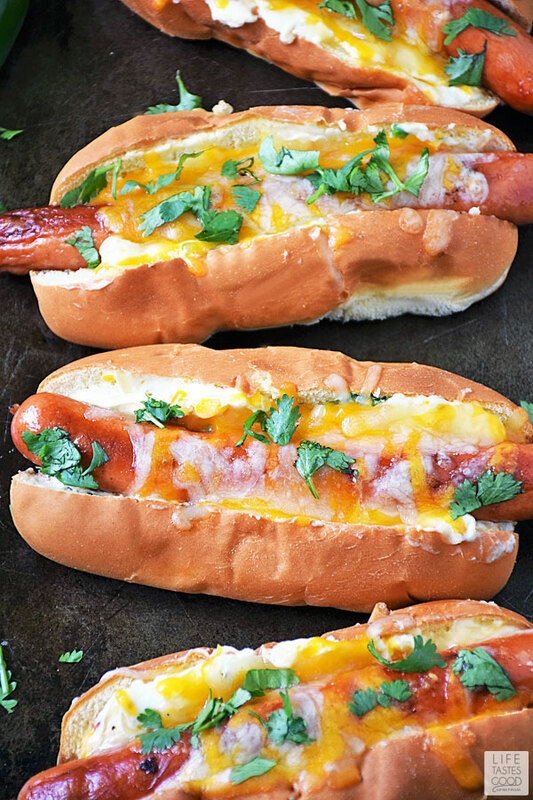 This Asian inspired hot dog recipe starts with a sweet and soft hot dog bun slathered in a garlic chili mayo which holds a crunchy, all-natural hot dog topped with tangy pickled vegetable slaw, finely diced jalapeno peppers, and finished with fresh cilantro. It is a flavor powerhouse! Finally, on the bottom right is my take on a Chicago style hot dog. I recommend using all natural beef hot dogs with no preservatives. They taste great and that unmistakable crunch when you bite into them is so satisfying! Click here > to learn How to Cook Hot Dogs a quick and easy way that produces a crisp hot dog with lots of flavor. Use top split buns for best results. They are easier to pile on the toppings and the toppings don't fall out when trying to eat them. I like that! To cook hot dogs, pour about 1/2 cup water into a skillet. You want just enough water to cover the bottom of the skillet. Place the hot dogs in the water and cook over mid-high heat until water evaporates. Once water evaporates, add 2 tablespoons butter and cook hot dogs for 2-3 minutes until they are nicely browned. Roll the hot dogs over to brown the other side - another 2-3 minutes or until they are browned to your liking. Spread 1 to 2 tablespoons of the cream cheese mixture on each hot dog bun. Place a cooked hot dog in each bun and sprinkle on the remaining cheddar cheese, dividing it equally among all hot dogs. Place the hot dogs on a foil lined baking sheet and place them in the oven under the broiler. Remember to leave the oven door ajar when broiling and watch them closely. It will only take 30 seconds to a minute for the cheese to melt. When the cheese is melted to your liking, remove the baking sheet from the oven. 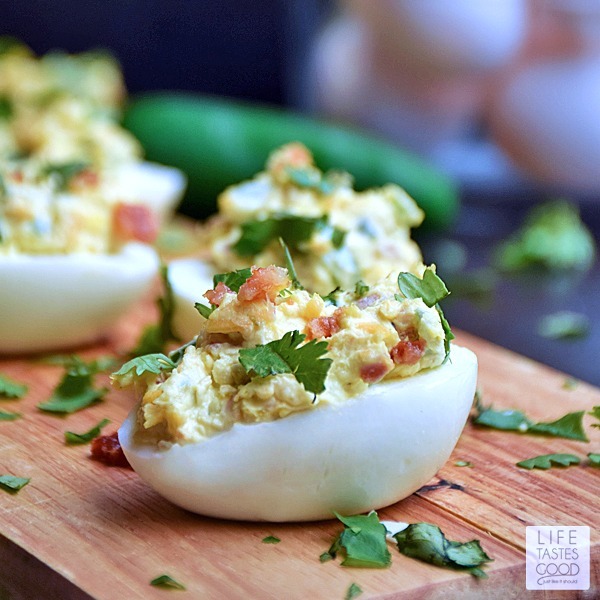 Garnish with freshly chopped cilantro and enjoy! 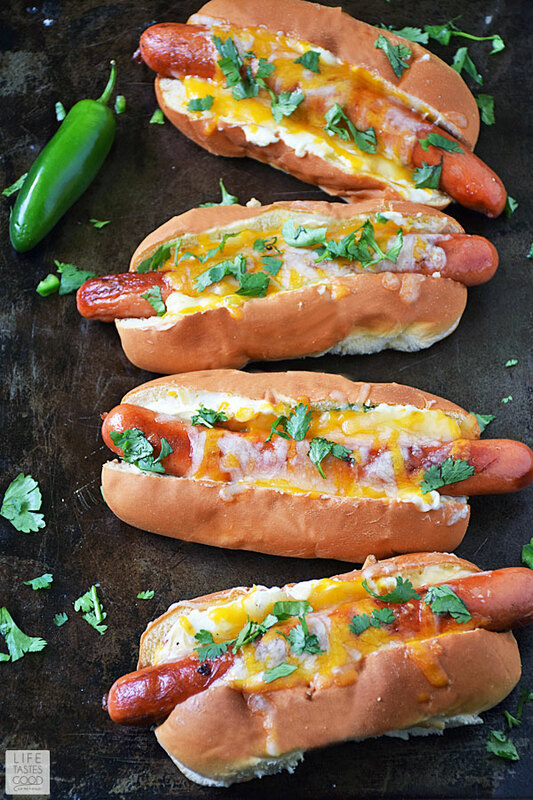 Your spicy, cheesy dogs look amazing!! My husband would absolutely love this hot dog. He loves spicy food. This would be perfect to serve game fans that come to watch the game! I also pinned your other hot dog recipes. The French Onion one especially looks delicious! We almost never eat hot dogs, so this was a really fun Sunday Supper week. These look super yummy! Yes, why not add all those great flavors to a dog....I love this recipe. Everytime i open a food blog in class, i want to punch myself in guts! I am so so hungry rn! This looks so good! Omnom!